Ataxia is the term used to describe symptoms and signs resulting from cerebellar dysfunction, manifesting with a combination of gait instability, limb incoordination, slurred speech and nystagmus. Ataxia is not a diagnosis; its presence necessitates investigations to establish a cause. Ataxias are rare and can be caused by a variety of disease processes that can broadly be divided into genetic or acquired. Establishing a diagnosis requires experience and a methodical approach using detailed clinical evaluation and appropriate investigations. The clinical pattern of cerebellar involvement, rapidity of onset, pace of progression, additional clinical features in combination with appropriate investigations are essential in reaching a diagnosis. As it is a rare disease, specialist input is often required if the diagnosis remains elusive after initial investigations. With the introduction of next-generation and exome sequencing, it has been possible to improve the diagnostic yield for genetic ataxias.1 ,2 Furthermore, better understanding of the immune aetiology for some of the acquired ataxias (eg, paraneoplastic cerebellar degeneration, gluten ataxia, anti-GAD ataxia, primary autoimmune cerebellar ataxia)3–5 meant that the overall diagnostic yield of investigating sporadic ataxias has improved considerably in recent years. Here we present our 20-year experience of prospectively evaluating 1500 patients with progressive ataxia at the Sheffield Ataxia Centre, Sheffield, UK. The Sheffield Ataxia Centre (SAC) was established in 1996 by MH and was accredited by Ataxia UK as a Centre of Excellence in 2007. The SAC has expanded since and now consists of two Consultant Neurologists (MH and PS), a Neuroradiologist (NH) with interest in ataxias, two specialist ataxia nurses (DF and SD) and a dedicated ataxia OT (JT) with input from physiotherapists and speech and language therapists. The Centre currently cares for 1500 patients with progressive ataxia and receives referrals from all over the UK. An ataxia database was set up from the establishment of the Sheffield Ataxia Centre in 1996. All patients are followed up on a 6-monthly or yearly basis and therefore, most patients have been followed up for many years. Patients without a clear diagnosis are reassessed and reinvestigated including repeat imaging and additional tests for rare causes of ataxias. All patients described here presented with progressive ataxia. Patients with ataxia due to structural pathology (stroke, space-occupying lesion, inflammatory demyelination, etc) were excluded. Patients with ataxia suspected to be related to excessive alcohol intake and those on long term use of phenytoin were also included because the aetiology of such ataxias may not be only down to toxicity.6 ,7 We have also included patients with ataxia due to superficial siderosis. All patients were assessed by MH, Consultant Neurologist with experience in the management and diagnosis of ataxias. Assessments included a detailed clinical history and examination, often repeated at 6-monthly to yearly intervals. All patients underwent extensive investigations as clinically indicated. Baseline assessments included full blood count, ESR, vitamin B12, folate, vitamin E, copper, urea and electrolytes, thyroid function tests, anti-GAD antibodies, coeliac serology (including antigliadin IgG and IgA, endomysium antibodies and transglutaminase antibodies), HLA type, immunoglobulins, ANA, dsDNA, ENA, intrinsic factor antibodies, thyroid antibodies and antimitochondrial antibodies. Genetic testing was initially confined to what was available at the time: testing for Friedreich's ataxia (FRDA), spinocerebellar ataxias (SCA) types 1, 2, 3, 6, 7 and DRPLA. This was later expanded to include SCA 12 and 17, episodic ataxias types 1 and 2. More specific genetic testing for ataxia telangiectasia and ataxia oculomotor apraxia types 1 and 2 was done at the Institute of Cancer and Genomic Sciences, University of Birmingham, UK. The introduction of next-generation sequencing meant that the number of genetic tests available increased to 42 different genes both dominant and recessive (see appendix A for a list of the genes). The new panel of NGS genetic ataxia tests was introduced in our genetics laboratory in June 2014. Such screening was initially undertaken just on patients with a family history and those patients with early onset sporadic ataxia (<20 years of age) as well as patients with adult onset sporadic ataxia where a genetic cause was clinically suspected. Testing for mitochondrial mutations was undertaken when clinically indicated and this included tests for MELAS, NARP, MERRF and POLG using blood DNA and with muscle biopsies if mitochondrial disease was still suspected after blood DNA testing was negative. Other investigations based on clinical evaluation included serum cholestanol, lipid profile, apolipoproteins, white cell enzymes, α fetoprotein, paraneoplastic antibodies, copper studies, ferritin, fragile X, very low chain fatty acids, phytanic acid, urinary amino acids, organic acids, skin biopsy, duodenal biopsies, whole body PET and neurophysiological assessments including back averaging, somatosensory evoked potentials and blink reflex for cases with myoclonic ataxia. A total of 1500 patients with progressive ataxia were assessed over a period of 20 years. All patients were over the age of 16 when they attended for their first assessment. A total of 295 (20%) patients had a family history of ataxia. The remaining 1205 (80%) had no family history (sporadic ataxias). The number of patients with a history of early onset ataxias (under the age of 20) was 83 (6%). Among patients with a family history of ataxia, 206/295 (70%) had autosomal dominant pattern of inheritance, the remaining 89/295 (30%) having a family history consistent with autosomal recessive inheritance. Among all of the patients with familial ataxias, a genetic diagnosis was achieved in 171/295 (58%), 128/206 (62%) in autosomal dominant and 44/89 (49%) in autosomal recessive ataxias. Table 1 summarises the genetic characterisation of the patients with familial ataxia and those with sporadic ataxia. In addition to the genetically confirmed cases of episodic ataxia, there were nine patients with a clinical history of episodic ataxia and positive family history where no diagnosis was achieved despite testing for all the known genes for episodic ataxia. The causes of sporadic ataxias are summarised in table 2. The commonest cause of sporadic ataxia was gluten ataxia accounting for 302 cases (25% of all sporadic ataxias). A genetic cause was identified in 157 patients (13% of sporadic ataxias) despite the absence of a family history. 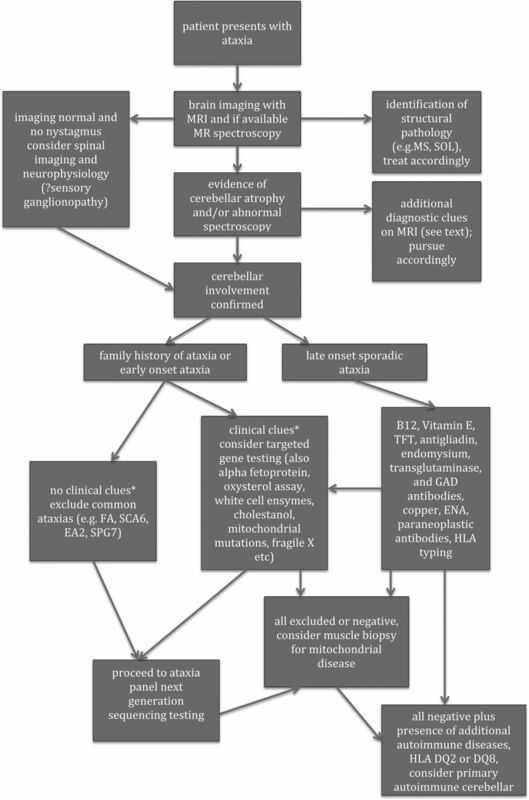 The genetic diagnoses in sporadic ataxias are summarised in table 1. 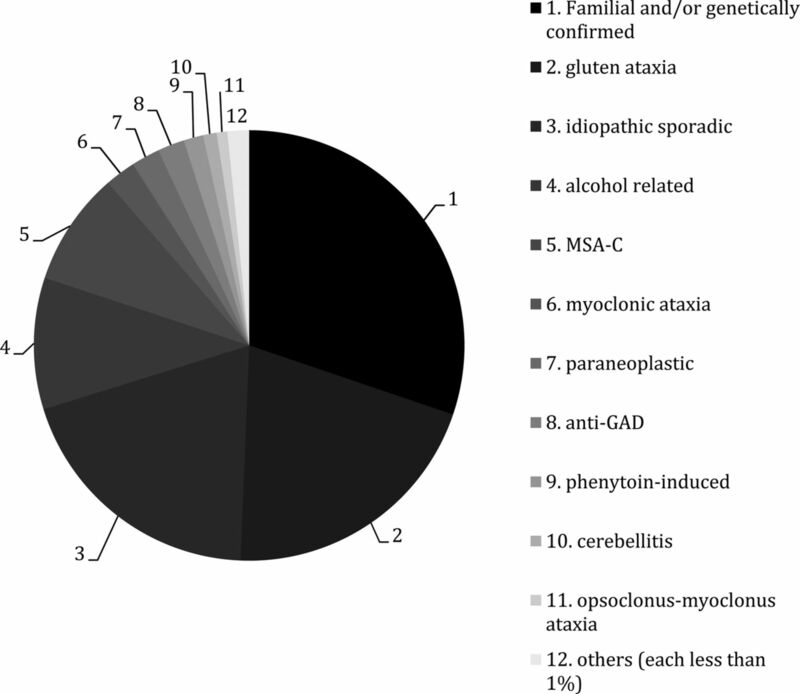 The third commonest cause of sporadic ataxia was alcohol related 147 (12%) followed by multisystem atrophy (MSA-C) 128 (11%), ataxia with myoclonus 35 (3%), 26 of which had gluten sensitivity. Paraneoplastic cerebellar degeneration was found in 32 patients (3%) and ataxia with anti-GAD antibodies in 30 (2%). Less common causes of sporadic ataxias included those associated with prolonged use of phenytoin in 22 (2%), cerebellitis in 15 (1%), superficial siderosis in 15 (1%), opsoclonus-myoclonus ataxia in 12 (1%), progressive ataxia with palatal tremor in 9, 3 HIV-related, 2 Wernicke syndrome and 1 copper deficiency. There were nine patients with a clinical history of episodic ataxia, without a family history but with no genetic confirmation. Figure 1 illustrates the causes of ataxias among 1500 patients. The genetic diagnoses among all 1500 patients ( familial and sporadic ataxias) can be found in figure 2. Causes of ataxia in 1500 patients with progressive ataxia. Genetic diagnosis in 327 patients with positive genetic testing. Testing a panel of ataxia genes using NGS (42 genes in total) was introduced at our regional genetics unit in June 2014. At the time of writing this report we had tested a total of 146 patients using the new ataxia panel. Of these, 54 patients had AD family history, 17 a family history consistent with AR inheritance, 33 had sporadic early onset ataxia and 42 had sporadic late onset ataxia. Positive results were obtained in 46/146 (32%) of patients (including 11 variants of uncertain clinical significance) as follows: 25/54 (46%) of patients with AD inheritance, 4/17 (24%) of patients with a family history consistent with AR inheritance, 12/33 (36%) of patients with early onset sporadic ataxia and 8/42 (19%) of those with late onset sporadic ataxia. None of the patients with EA2 had any clinical evidence of ataxia of an episodic nature but instead had a slowly progressive ataxia often associated with cognitive impairment. The identification of 4 patients with SPG7 using NGS enabled us to identify a typical clinical phenotype consisting of slurred speech, ataxia, mild (often minimal) spastic paraparesis and proximal weakness resulting in waddling gait. Using this clinical information, we then screened directly for SPG7 those patients with clinical features suggestive of this phenotype (58 in total) identifying another 28 patients with SPG7 (pick up rate of 48%). SPG7 therefore became the commonest new genetic ataxia identified. Table 3 summarises the genetic diagnoses using NGS with further information on some gene variants. The number of patients from the whole cohort of 1500 patients with clear history of early onset ataxia (under 20 years of age) was only 83 (6%). Of these, 63/83 (76%) had no family history of ataxia, the remaining 20 having familial ataxia. Five patients from the 83 had other causes, leaving 78 patients without a diagnosis. A genetic diagnosis was made in 81% of this cohort of the 78 patients with the most common ataxia being FRDA (26 patients). For the purpose of establishing the diagnostic yield following attendance at the SAC, the 1500 patients were divided into two groups. Group 1 (87%) consisted of patients referred where no diagnosis had been made ( sporadic and familial cases). Group 2 (13%) consisted of patients with an established diagnosis (mainly familial eg, FA) that were referred for expertise in the management of that particular ataxia. After investigations at the Centre, a diagnosis was achieved in 63% of patients in Group 1. This report is based on a large cohort of patients with progressive cerebellar ataxia attending a dedicated Ataxia Centre over a period of 20 years and informs the process of investigating a patient with progressive ataxia. While progressive ataxias can be familial, the commonest presenting scenario is that of a sporadic ataxia (80%). These figures may differ at different ataxia centres depending on local expertise and practice. For example, neurologists may be more inclined to refer a patient with familial ataxia (rather than a sporadic case) to an Ataxia Centre with an interest in genetic ataxias meaning that the cohort of patients assessed will have a bias towards familial rather than sporadic ataxias. The SAC cares for patients with any type of progressive ataxia and referrals include patients with sporadic, often idiopathic ataxia, as well as patients with familial ataxias. We therefore believe that the distribution of the different types of ataxias may be a realistic representation of the spectrum of ataxias in the UK. The diagnostic yield for patients with idiopathic ataxia referred to the Sheffield Ataxia Centre was 63%, a figure that justifies referring patients with progressive ataxia and no diagnosis to dedicated Ataxia Centres for further evaluation. Our results suggest that the absence of a family history should not preclude investigation for a genetic cause. Indeed, a confirmed genetic diagnosis was the second commonest cause of sporadic ataxia, accounting for 13% of all sporadic ataxias. The overall potential genetic aetiology for progressive ataxias based on this cohort of 1500 patients was at least 30% (ie, all familial cases plus those sporadic cases with genetic confirmation). The introduction of NGS has had a significant impact on our ability to genetically characterise patients with ataxia, with an overall diagnostic yield of 32% but a higher figure of 46% when applied to patients with an AD family history. The figure of 32% from this study compares to 18% in a previous publication from the UK based on 50 patients.1 Possible explanations for the differences may include differences in the two NGS ataxia panels, the selection criteria and the larger size of the current cohort (146). A more recent study also from the UK identified confirmed pathogenic variants in 9/22 (41%) families with unexplained ataxia, a figure closer to what we have found.2 All three studies, however, demonstrated that the presence of family history substantially increases the diagnostic yield of such testing. 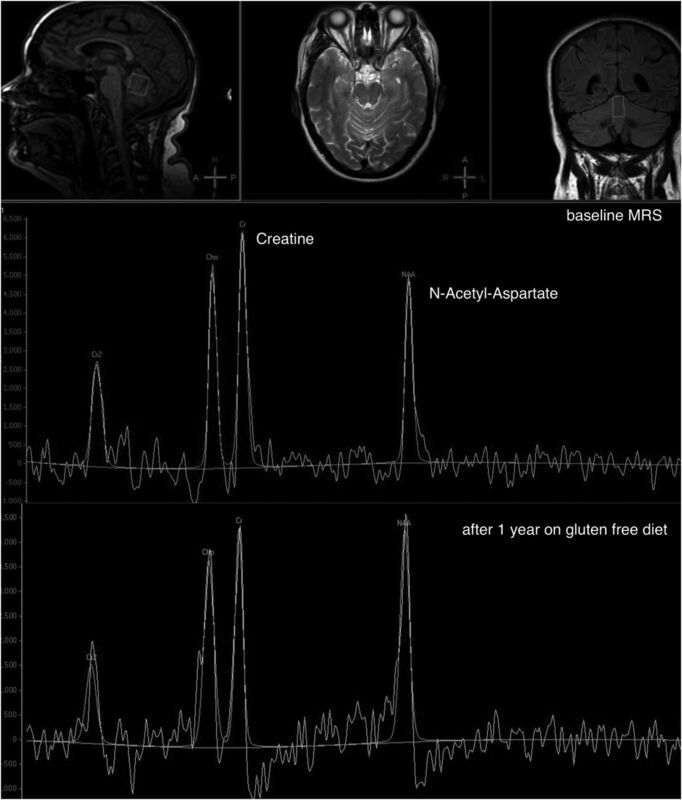 MR spectroscopy of the vermis from a patient with gluten ataxia showing improvement of the NAA/Cr (N-Acetyl-Aspartate/Creatine) ratio after 1 year on strict gluten-free diet. NAA/Cr ratio reflects metabolic activity within the region of the interest (voxel) and is reduced (<1) in diseases of the cerebellum. The increased ratio reflects improved metabolic activity associated with clinical improvement. Suggested approach to the investigation of the ataxias. *clinical clues may include: ophthalmoplegia, autonomic dysfunction, retinitis pigmentosa, spastic paraparesis, waddling gait, myoclonus, tendon xanthomata, loss of upgaze, cognitive deficits etc. This study suggests that overall the commonest genetic ataxias in the UK are FRDA (23% of all genetically characterised ataxias) followed by SCA6 (14%), EA2 (12%) and then mitochondrial (various mutations)9 and SPG7 each accounting for 10%. Of the new genetically characterised ataxias, SPG7 was the commonest and although it comes under the umbrella of Hereditary Spastic Paraparesis, ataxia is the most prominent feature with minimal, if any, evidence of spastic paraparesis. Our findings are in agreement with a previous publication suggesting that SPG7 is a common cause of ataxia.13 Patients with SPG7 also have clinical evidence of proximal weakness giving rise to waddling gait, making this entity very distinct and easily targeted for direct genetic testing. Indeed, in 28 out of the 33 patients diagnosed with SPG7, direct genetic testing for SPG7, rather than NGS ataxia panel testing, was used. Unlike previous reports the presence of ophthalmoplegia was extremely rare in our cohort of SPG7 (only one out of 31 patients). 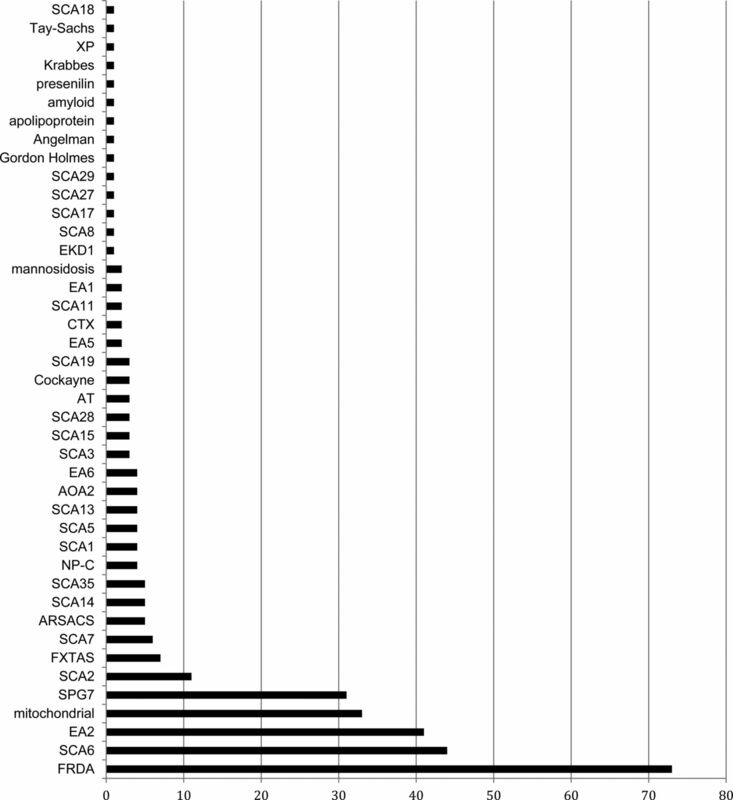 Of interest is also the fact that NGS identified 11 patients with EA2, none of which had a history of episodic ataxia. They had a slowly progressive ataxia often associated with mental retardation and cognitive deficits.14 This was the commonest genetic ataxia identified using NGS. EA2 should therefore be included in any NGS ataxia panel. Gluten ataxia was the commonest cause (25%) of sporadic ataxias in our cohort. As this entity was first identified and characterised at SAC, we acknowledge the possibility of bias and overrepresentation of this entity.15 ,16 While patients with gluten ataxia (particularly those with enteropathy) are increasingly diagnosed by more neurologists across the UK and abroad, not all patients are referred to our centre as the majority of patients with gluten ataxia respond to strict gluten -free diet, a treatment that can be instigated and monitored locally.17 Indeed 87% of patients with gluten ataxia that we care for are patients labelled as having idiopathic sporadic ataxia elsewhere, referred to our centre and found to have serological markers of gluten sensitivity with or without enteropathy. The presence of enteropathy (associated with the presence of positive anti-TG2 and endomysium antibodies) does not influence the response to the gluten-free diet and thus any patient with positive serology and no other cause of ataxia should be treated with strict gluten-free diet even in the absence of enteropathy.18 More of a hurdle is the fact that the serological markers of sensitivity to gluten for those patients without enteropathy (eg, antigliadin antibodies and TG6 antibodies) are not universally available in the UK and thus, some patients remain undiagnosed and untreated. Cerebellar variant of MSA-C is another common cause of sporadic ataxia (11%). Clinically, this condition can easily be diagnosed based on the presence of additional features: early speech involvement, autonomic dysfunction, rapidity of progression and severity of disability, and very often the typical appearance on MR imaging of the hot-cross bun sign.20 MR spectroscopy characteristically demonstrates an extremely low NAA/Cr ratio within the vermis and hemispheres at baseline even before the appearance of the hot-cross bun sign and can thus be helpful diagnostically. Despite significant advances in genetics and in our understanding and recognition of immune-mediated ataxias, 291/1500 (19%) remained undiagnosed and were labelled as having idiopathic sporadic ataxia (ISA). Other terms have been used to describe this group, for example, ILOCA (idiopathic late onset cerebellar ataxia)21 or SAOA (sporadic adult-onset ataxia of unknown aetiology).22 Although the aetiology is likely to be a heterogenous, there is some evidence that a substantial proportion of patients within this group may have primary autoimmune cerebellar ataxia (PACA).23 The evidence for this includes the significant over-representation of the haplotype HLA DQ2, the significantly higher prevalence of one or more autoimmune diseases in patients with idiopathic sporadic ataxia when compared to the general population and to patients with genetic ataxias (47%, 3% and 5%, respectively), and the presence of antibodies against cerebellar neurons in at least 60% of patients with idiopathic sporadic ataxia compared with 5% of patients with genetically-determined ataxias.24 The diagnosis of PACA remains problematic due to the lack of a readily available biomarkers. Despite this, PACA may prove to be a treatable disorder given the autoimmune pathogenesis. The cerebellar ataxias are challenging to diagnose. They require methodical approach in order to reach a precise diagnosis. Dedicated Ataxia Centres are helpful in establishing a diagnosis in patients with idiopathic ataxia. The advances in genetic testing using NGS have significantly improved the diagnostic yield in patients suspected of having a genetic cause. Equally important are the acquired (sporadic) ataxias as some may be amenable to therapeutic interventions, particularly those with an autoimmune pathogenesis.
. Cerebellum and Immune diseases. In: M Manto, ed. Handbook of Cerebellum and cerebellar disorders. Dordrecht: Springer, 2013:1985–2007.
. Alcohol-related cerebellar degeneration: not all down to toxicity? Cerebellum Ataxias 2016;3:17.
. Should we be ‘nervous’ about celiac disease? Brain abnormalities in patients with coeliac disease referred for neurological opinion. J Neurol Neurosurg Psychiatry 2012;83:1216–21. http://dx.doi.org/10.1136/jnnp-2012–303281.
. Idiopathic late onset cerebellar ataxia. A clinical and genetic study of 36 cases. J Neurol Sci 1981;51:259–71.
. Primary autoimmune cerebellar ataxia (PACA). Adv Clin Neurosci Rehabil 2010;9:8–11.